There is a long tradition of supernatural felines in Japanese ghost stories. There is also extensive shapeshifting lore about kitsune fox-spirits, but Japanese lycanthropy typical does fit the lupine mold. Nevertheless, a Japanese werewolf wreaks havoc on an American frontier town in Eduardo Castrillo’s The Last Wolf of Ezo (trailer here), which releases today on DVD from Maverick Entertainment. Karukan’s clan was honor-bound to hunt down and kill the savage werewolf, but when it hopped a steamer for America in human form, the Emperor was content to leave it be. However, Karukan was still obligated to follow it on his own. It is not exactly a great time to be Asian in the Old West, but Karukan forges an alliance with Langdon, a gunslinger-cardsharp that evolves into a bickering friendship. When they hear of a beast terrorizing River City (honest, that is what it’s called), they make haste, but find a dodgy band of bounty-hunters has been retained to dispatch the beast. Of course, they have no idea what they are getting into. 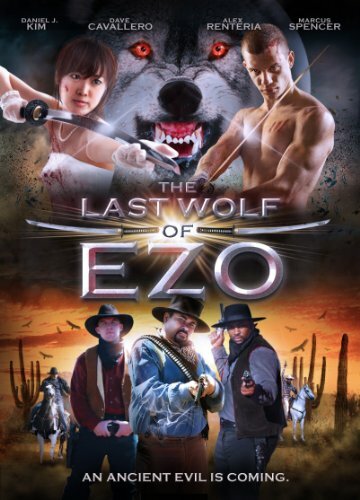 The pitch for Ezo practically speaks for itself: Kung Fu meets The Wolfman. However, it needs to do better than a C-level execution, given its budget constraints and the recent mini-boomlet of weird west competition. In fact, it has pretty terrible timing, releasing the same week Bone Tomahawk hits theaters and not long after Jeremy Wooding’s over-achieving Blood Moon launched on DVD and VOD. Although Wooding’s resources were probably just as limited as what was available for Castrillo, Blood Moon’s vivid characters and dynamic energy make it a B-movie delight. Unfortunately, the same is not exactly true of Ezo. There are a few laughs in the right places and the Japanese flashback scenes look better than you might expect, but the entire film basically feels like everyone is trying to get from point A to point B with the least amount of fuss. Professional kickboxer Daniel J. Kim has the right strong, silent presence, but here he is working with sub-standard fight choreography. Alex Renteria probably makes the strongest impression as Langdon, playing his roguishness to the hilt. However, there are simply too many bounty hunters and outlaws, washing in and out and blending together. Still, Lexy Gama (as Karukan’s young love) and the rest of the Japanese cast are surprisingly solid. Maybe Castrillo should have kept that wolf off the boat. On paper, Ezo sounds like a blast, but it is not nearly as nutty, inventive, or twisted as its microbudget requires. That is frustrating, because it has a number of elements in place. Nevertheless, if you want to see an Old West werewolf movie, check out Blood Moon, you know, the British one. Regardless, The Last Wolf of Ezo is on-sale today (10/20), from Maverick Entertainment.